70 degrees and sunny with an easy breeze. You’re itching to hit the road. Whether it’s the mountains, the golf course or you’re just driving to work there’s always that chance for a cosmetic accident, ….bug marks or bird droppings. After all, they don’t call them accidents because you planned on having one. With that said, you can be prepared for a cosmetic accident. 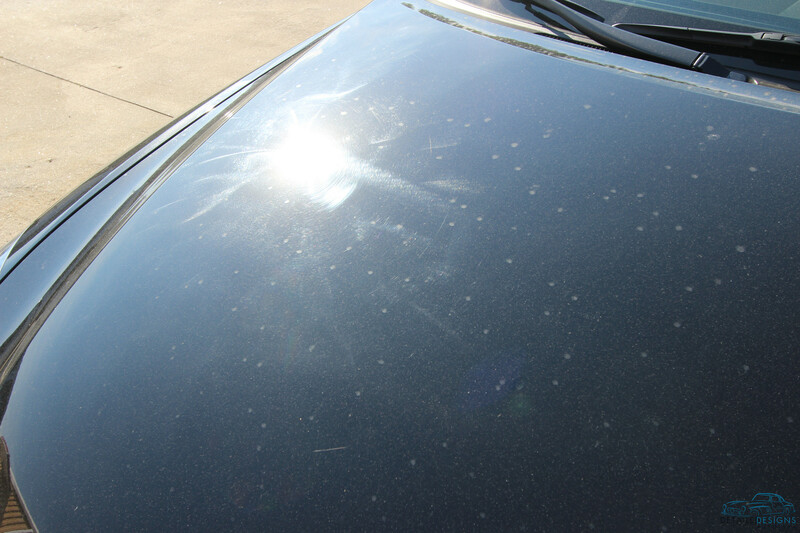 Bird droppings, bug marks, tree sap and road goo can impact the health of your paint any time you hit the road. By planning ahead and keeping just a few products in your boot, you can be well prepared to fend off these common enemies to every car enthusiast. 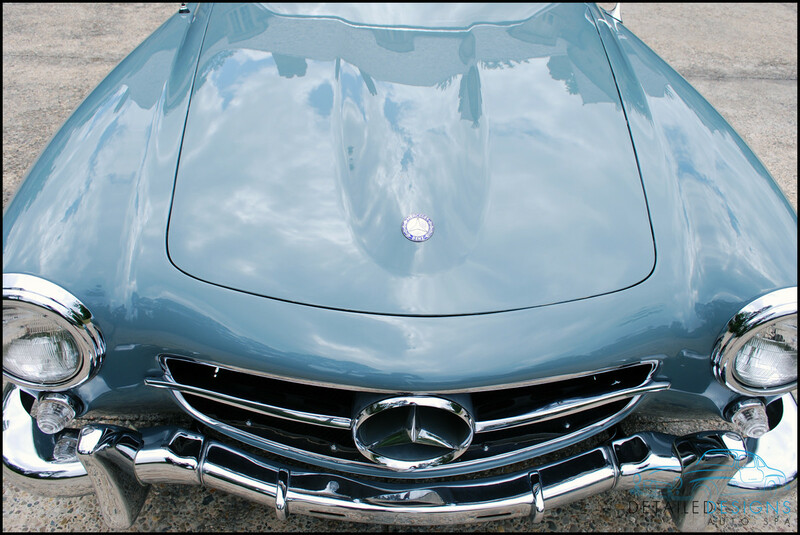 Bird droppings and bug marks can etch your clear coat after just a few minutes. Tree sap left on paint can lead to it curing and being near impossible to remove. Chemicals and liquid substances from the road will be more difficult to remove the longer it’s left on the paint. Time is a major factor in all of these circumstances. The faster you can remove the contaminants, the healthier your paint will stay. There are really only a few products you need that will tackle 99% of the potential problems you can encounter for an emergency. This towel will provide a gentle means to grab and remove the contaminants after they have been treated. This is the least aggressive product you can treat a contaminant with. There is a nice variety of products that you can use. I formulate my own quick detailer from Optimum No-Rinse. This is what you will use to cut heavier contaminants. I am a huge fan of p21s Total Auto Wash.
As far as technique is concerned, there are a number of routes you can take. If the problem is a fresh bird dropping, try folding up the microfiber towel, spraying one side and place it on the dropping. With minimal time to sit on the dropping, it should wipe up easily. The same technique can be used on a fresh bug mark. If you’re looking at a heavier contaminant like tree sap, try this. Spray the microfiber towel with the p21s TAW and allow it to dwell for a few minutes. Remove the towel from the paint, flip the towel and spray some p21s TAW on the reverse side and then gently wipe the tree sap. If the sap cleaned up, refold the towel and spray some quick detailer on an unused portion. Wipe the p21s TAW residue off of the paint. Repeat with a different microfiber towel if the one you were using is too wet with cutting agent. This same method can be used on road tar, paint or other heavy road liquids. If the pH-neutral cutting agent is not biting into the contaminant enough, make arrangements to wash the car soon and get as aggressive as required. Some substances will not simply break down with lighter cleaning agents. The goal is to lightly remove substances quickly, not get so aggressive that you generate surface damage with heavy force. When doing a spot clean while out and about, do not leave cutting agent residue on the paint in direct sunlight and always follow up your heavier cleaning option with quick detailer. This will ensure that you do not cause chemical filming on the paint which can be very difficult to remove. By keeping these few items with your automobile at all times, you will be well prepared to take care of many of those common “aww man!” moments that hits at the most inopportune time. Once your car has corrected paint, it is VITAL that you take as best care of it as you can! If you don’t, you will end up with more swirls and scratches. Your wash should begin with cleaning the wheels. Check out our page dedicated to cleaning wheels for more information on a safe and thorough method. For vinyl trim, use a non-caustic cleaner like 1z Plastic Deep Cleaner. Spray the cleaner on the wetted vinyl surface and agitate with a soft bristle brush. For very dirty surfaces, you may need to also wipe down the vinyl with a microfiber towel. Multiple treatments may be required. Rinse vinyl and paint surfaces below the vinyl until all residue is removed. It’s important, as with all cleaners on hard surfaces, to not allow the chemical to dry out. You will be left with a film that may be difficult to remove. The gaps between panels and hidden spots like the gas cap area tend to collect grime. Use a pH balanced cleaner like p21s Total Auto Wash and a soft bristle brush to agitate. Rinse after cleaning. The best wash method that will minimize creating new swirl marks is the two bucket wash method. You will need two clean wash buckets along with grit guards in each bucket. This will keep the dirt in the bottom of the buckets and the mitt above the dirtiest part of the water. One bucket will be used as a shampoo bucket and one as the fresh water bucket. Treat your shampoo bucket as the one you will wash your car from and the fresh water bucket will be the one you clean your wash mitt with AFTER touching the car but BEFORE you dip back into your shampoo bucket. The fresh water bucket will act as a mini-washing machine for your mitt. The idea is that you keep your shampoo water as clean as possible because it’s the one your actually washing your car from. It can’t hurt to have another bucket and wash mitt for doing the lower panels of the car. Lower sections will inevitably get dirtier than the upper areas. Why intermingle areas that are more prone to heavier filth? Do not be reluctant to dump the water out of the buckets and refill before you finish your car if the water gets notably dirty. You will keep a separate bucket for cleaning wheels and tires. There’s far too much risk of contaminating your wash buckets. Never intermix wheel buckets and wash buckets. Use a quality wash mitt. Sponges are no nos because they trap dirt against the paint. Use something similar to a sheep skin mitt, a quality micro chenille or a microfiber wrapped sponge. You want to keep as deep a nap as you can on your wash media. This enables it to keep the dirt from being trapped between the paint and the wash media. A good mitt is only so good by itself. A quality shampoo that will lubricate the surface and do a fine job loosening dirt is a requirement. I prefer 1z Einszett Perls Shampoo. A nice selection of products designed to clean specific trouble areas like bug marks and road tar are good to keep on hand. This will allow you to clean thoroughly without using too much pressure and creating new swirls marks. Tar can be removed with Stoner’s Tarminator. No Mr. Miyagi wax on, wax off -circular motions allowed while washing. Wash in straight lines as best as you can. Ideally, washing from the top down is the best. The top portions tend to not be as dirty as lower portions. Working the from the top to bottom lends itself to a more gentle wash. Following these tips will lead to a thorough wash that is more of a mini-detail than a car wash. You will be cleaning better and safer than any corner car wash shop. Have any questions about washing? Feel free to post up any questions and I will get back with you as soon as I can. Check out the Safest Way to Dry Paint page for drying tips! At some point or another, all of us are going to call upon a professional car detailer to take care of us and our car, boat or plane. Maybe you usually take care of your personal detailing needs yourself. But inevitably, someone will spill a coffee that leaves a smell and stain, a shopping cart will scuff your door or maybe swirl marks in the paint job will get too bad and you’ll need a professional’s touch. Maybe you have been using professional car detailers but have not been satisfied. I know that most people will say that after having their car detailed they will always find something that was done poorly. This article is about how to find that *special* someone that will take care of your car as well as you. For most people, an automobile will be the second most expensive purchase in their life, behind a home. You’d better be sure you’ve found the right person before you hand your keys over to a stranger! I offer this information with experience as a professional car detailer and business owner. I am the owner of a detail shop that specializes in quality paint protection film and clear bra, restorative detailing and paint correction serving the greater Atlanta area. When you first begin your search for the right company and person to take care of you, be aware that the industry has some major flaws. The majority of professional car detailers are going to be uninsured, newly formed/inexperienced or are just looking for a quick buck. There are no organizations that a quality and legitimate company will be a part of that will set them apart from those types of companies. It is completely up to you to distinguish who will be the right fit. I am going to give you information that will make it easier to decipher who’s real and who’s not. This will be done by spending some time, on the phone or in-person, with the detailer and asking a few key questions. Why is insurance so important? It may seem a small thing, but insurance is a safety net for you as well as the company. I doubt any company would intentionally damage a car, but it still happens. That’s why it’s called an accident. Some accidents can be paid out of the pocket and some can ruin a life. If a company does not have insurance and an accident were to occur, chances are it will effect you far more than the company. After all, it’s your car. So it’s your pocket and wallet that will suffer should an accident occur. Why don’t most companies carry insurance if it’s so vital? The answer is very simple and I am sure you already know the answer…dollars and cents. Garage keeper’s insurance is very expensive. Many professional car detailers do not want to spend $2,000+ per year on something they feel they won’t ever use. Garage keeper’s insurance is the most ideal type when working on cars. It completely covers a vehicle when someone or a company has taken possession of a car, in a shop or if a car must be driven, say, for a pick up or drop off. Some general liability types of insurance are acceptable. It’s best to make sure your detailer as well as you have a full grasp of what his insurance covers. Given the chance of costing you a lot of money and headache, as well as the fact a lot of professional car detailers are not going to carry proper coverage, it should be the first topic discussed with the detailer you are interviewing. Many people are experiencing hardships due to layoffs. Unfortunately, many are turning to cheap start-up companies to make some money. “Detailing”(and I use that term loosely here) fits the bill for many looking for a cheap start-up. They can spend $200 on a used shop vac, used pressure washer, some buckets, a mitt, soap, some brushes and a few cleaners and be in business! How exciting! ….erm…no…it’s not exciting, it’s scary. Think about it this way. What do you do for work? Are you good at it? Why are you good at it? Is the answer because you have been doing it a long time? Maybe you’ve encountered many bumps in the road and know what to do when you come across that odd problem or issue. You’re not intimidated by your job because you know it inside and out. Do you remember when you first started? How much more do you understand and know of your job now with years of experience? Are you worth more to your employer now than when you started? It is the same with professional car detailing. There is no substitute for experience. This is one aspect most people will not think about and it’s a shame. We live in a throw away society. That throw away attitude is not limited to material objects. Many companies view customers as throw away. If they make you upset for any reason, there’s someone behind you to fill the spot. You are nothing but a number. This is bad because they have no tie to you except that money in your pocket, today. If you’re not happy with the job, you will hear, “welp, that’s the best we could do.” Then comes the cold shoulder. You’ve just been replaced. They don’t have a desire to keep you as a lifetime customer. They are not going to give you the attention you deserve. You are a dollar bill and that’s all. But not all professional car detailing companies feel that way. Some actually value you as a customer as well as an individual with individual wants and concerns. The absolute best way to find out which type of person or company you are dealing with is to spend a little bit of time with them. What you discuss is not even that important. The truth is, if they care the least bit for you, if your more than just a number to them…they will give you their time. We spend time with our friends because we care for them and like them. It is the same with a business/customer relationship. In my case, I encourage every new client to make the time for a free consultation. This does two things. It gives me time to find out what’s important to my client and enables me to custom fit services to them. Everyone is different and are looking to get what they want. It also gives my client the ability to get a complete understanding of my company/me and what we do that is so special. Everyone benefits. When my services are completed I spend time with every client showing them how to properly care for their car, boat or plane. I do not set a time limit on how long I spend with my client. You’ve just spent your hard earned money having it cared for. I encourage everyone to take the time to learn more about proper car care. Knowledge is power and in this case, knowledge is $$$ too. Have a question and you’re hurting for an answer? Call me. I always have time for my clients. My personal goal is to completely satisfy my clients, educate them and by extension, have a new client for life. If you take advantage of these tips, you can find a detailer who feels the same way I do. You will spend less in the long run, have a better looking and smelling car that is more valuable. Where Do Swirl Marks Come From and How Can You Eliminate Them? If you’ve heard that, I bet you’ve also heard yourself asking the question, “HOW DID THE SWIRL MARKS COME BACK?!! I just had them fixed!” a few weeks or so after you left with a shiny car. This article is designed to educate you on the whys and hows of swirl marks and what it takes to finally get rid of them. We will also speak about what causes different surface defects. The culprit, swirls on a hood. 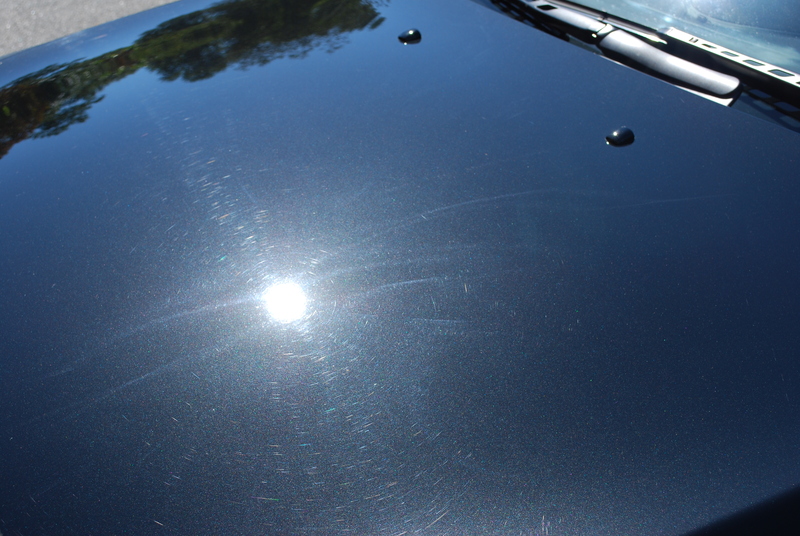 Swirl marks are light etchings, or scratches, in the top layer of paint that’s called clear coat. (Single stage paint can have swirls as well, but we will be discussing clear coated cars today as cleared cars are what is common for 99.9% of the new cars on the road.) Swirl marks causes refraction of light as opposed to reflecting light cleanly. Other types of defects include, acid rain marks, holograms or buffer trails, sanding marks, bug marks and bird droppings. The end result is the same on all of these. 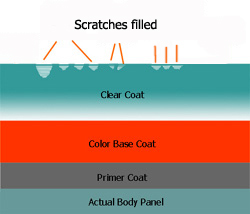 The top layer of paint, the clear coat, is no longer smooth on a microscopic level and is refracting light. Clear coat prior to proper preparation for correction. Your paint probably has many surface contaminants in it(please note the image above) as well as the actual scratches and etching. 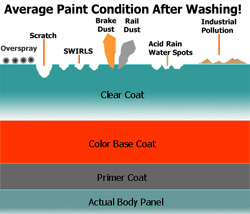 These surface contaminants will not come off of the paint with a wash. They are bonded to the paint and require a means to deep clean or exfoliate. This is where clay bar comes in. Clay bar is used to exfoliate painted surfaces by grabbing the contaminants as it is glided over the paint. 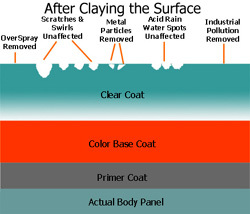 Clay bar decontamination is not necessarily a quick process. It takes time to thoroughly remove contaminants. Because clay bar is used to specifically remove contaminants and keep a hold of them, clay bar has a lifespan and must be thrown away once contaminated. After clay barring, the surface is cleaned of contaminants but the defects remain. If someone were to run a buffing pad over those contaminants without properly clay barring the surface can you imagine how much new damage would be created? Now that your surface is clean of contaminants it’s smooth to the touch. But it still has scratches and looks rough. This is because there has been no correction, only preparation. 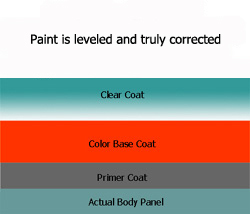 Correction is the method of leveling the surface of the paint. It is not filling the paint to trick the eyes. Once corrected, the paint will stay looking fantastic as long as no one acts carelessly with bad washing and/or drying techniques. 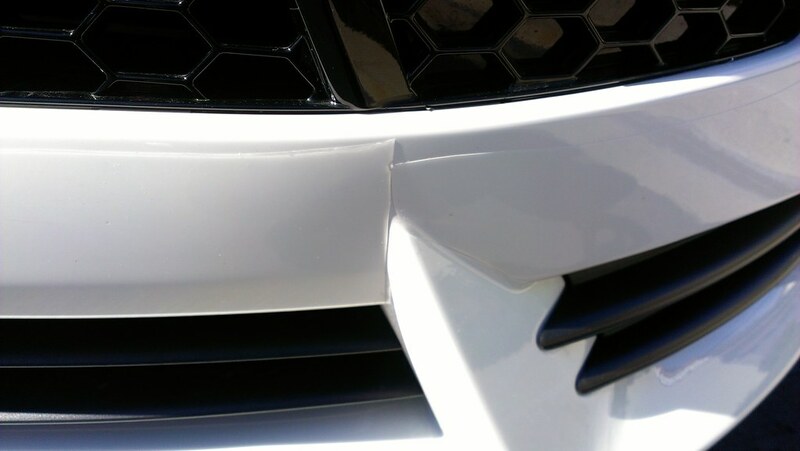 Correction is a permanent solution for your existing swirl marks and scratches. Correction and filling. Those are your options as a patron of a detail shop. The question is, which one is being done? Do you understand what filling means? It’s exactly as it sounds. It means someone levels the clear coat by means of filling in the defects on a microscopic level. It looks good for the moment but THIS is what causes your swirls to naturally come back, even with proper care. The filler will not stay very long. It will wash out over the course of 2 or 3 thorough washes and you’re right back to where you started, minus $125 or more. This surface has been filled. Can you see why it won’t stay? The appeal of using compounds and polishes that have fillers is that they offer an incredibly fast, temporary and cheap fix. A car can be washed and buffed with a filler in about 2-3 hours. What’s been left out is the prep work such as clay barring the surface and taping off sensitive areas that could be stained with polishes, such as rubber seals and gaskets. 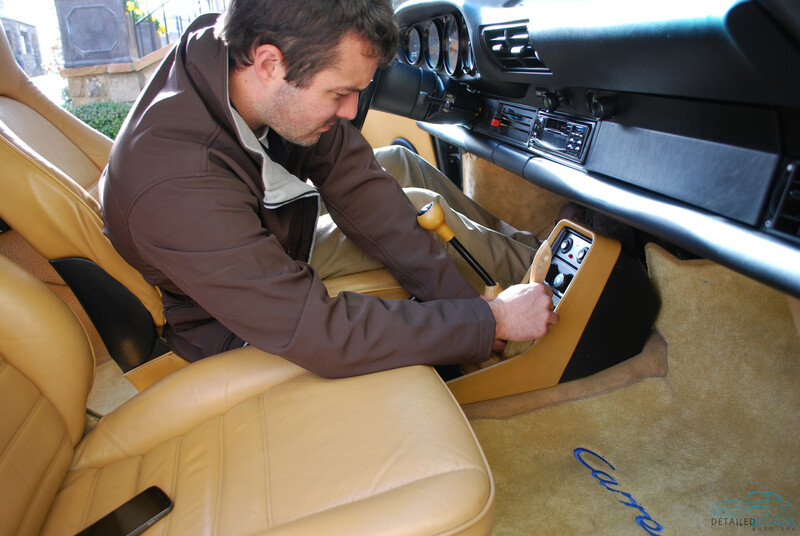 A properly trained detailer will do all of the prep work necessary without upcharging for it. It is necessary, not optional. 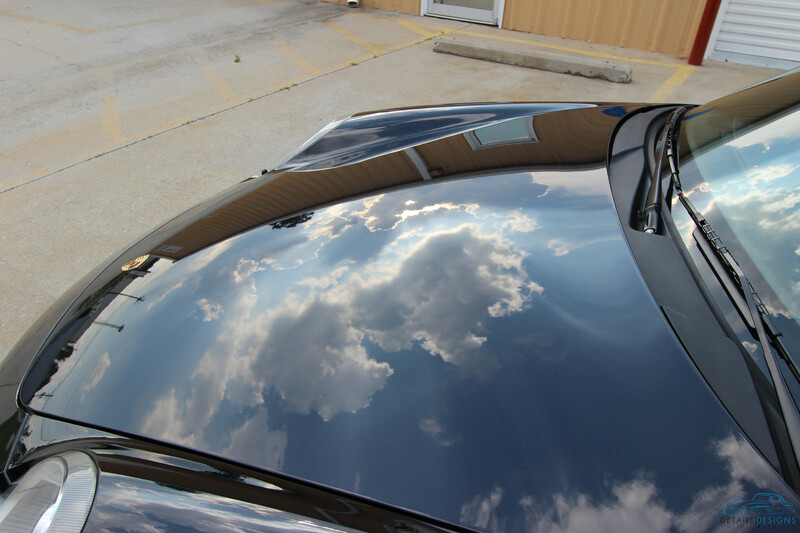 The right fix for your existing scratches is to receive thorough paint correction. This is done by using corrective compounds and polishes to level the paint. Some may feel spending a more on true correction is unreasonable. What’s unreasonable is paying someone multiple times per year to redo a filler job for the life of the car. What makes sense is paying someone to do it right the first time and forgetting about it. You will also benefit because the paint will look better and your car will be worth more. This paint has been properly corrected and now looks better than new! Correction does not have to mean you’re risking taking off too much clear coat. Scratches and swirl marks dictate how much clear coat is removed and in 99% of the cases, it’s about 2% of the paint. A detailer should have and use a paint depth gauge. This will give good insight into how far is too far before they get there. 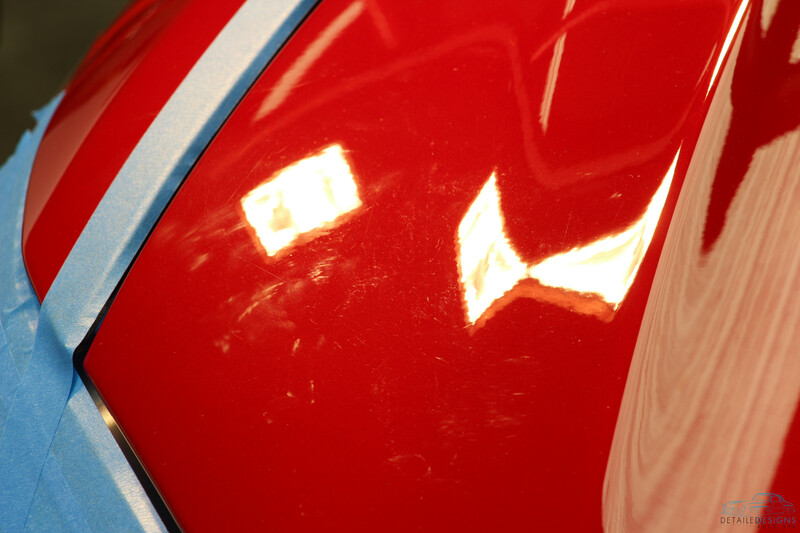 Whether correcting paint or filling, there is a risk that someone could burn through the clear coat. This is a problem with inexperienced detailers or detailers who feel rushed. It is necessary to realize that proper correction takes time and one should not feel rushed to meet a deadline. It is an art form. Your car is the canvas. Do you want a rushed piece of art or one that the artist took his time to perfect? If you ask 10 different detail shops if they truly correct the paint or not, 10 of them are going to tell you they will fix the problem. Many are even heartfelt when they answer. The truth is, most don’t understand what real correction is. They are so hung up on getting you to hand them your keys that they will use the cheapest products and the fastest methods that can get them to meet that price point most are looking for. When the filler washes out, you’re weeks down the road and you know it’s going to be a lost battle. In this case friends, you get what you pay for. True correction takes much longer than using filler because you’re not just filling with silicone, you’re leveling clear coat. Filler can be just run over the surface. One of the biggest tell tales of if someone is truly correcting is in how much they charge and how long they will spend on the car. If they are a legitimate company they will have legitimate expenses and can not afford to spend 10+ hours on a car’s exterior for $125. For a true multiple step correction, it is reasonable for a shop to have 15+ man hours into a single car. In cases where there is major damage or clear coat that is extra hard(difficult to get results on) it may take 40+ hours. 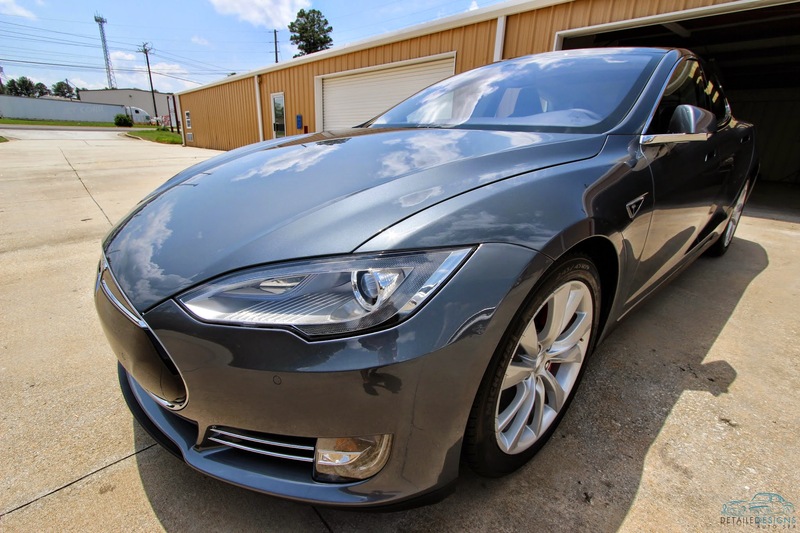 If you’re in the Atlanta market and are searching for a quality solution for your car detailing and paint correction needs, Detailed Designs Auto Spa is qualified to care for your car and will ensure your best interests are cared for. Call us today to schedule a consultation.